I haven't posted in about a month. I was going for weekly posts there for a bit, but have gotten caught up in my RHCSA, OpenStack, and SAN/NAS studies. Not to mention Family, work, and some sleep here and there. Now that my RHCSA exam has been cancelled twice by Red Hat (separate locations), I'm taking small pauses to do some personal stuff, like posting here. For folks pursuing the Comptia Linux+, LPIC-1, or the Novell Certified Linux Administrator, there is good (old) news! When you pass the certification for the Comptia Linux+ exam, you also qualify for the LPIC-1 as well as the Novell Certified Linux Administrator certification. These partnerships were made back in early 2010, however I don't think a lot of certification candidates realize the option is available to receive all three certifications with one exam. When ever the partnership is brought up in forums, a handful of people always seem to ask questions about how to go about receiving their Novell certification (Linux+ being the more popular choice). LPI is pleased to announce that holders of LPIC certifications are now eligible to apply for and receive the Novell Certified Linux Administrator (CLA) certification at no additional cost or exams. This initiative is the result of a new partnership agreement between Novell and LPI. 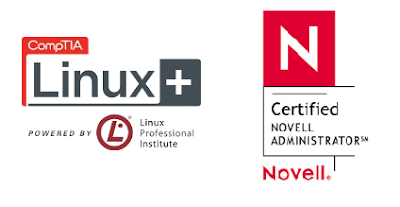 Under this program those Linux professionals who have earned their LPIC-1 status will also have satisfied the requirements for the Novell Certified Linux Administrator (CLA) certification. To further support this initiative Novell Training Services has formally agreed to include the required LPIC-1 learning objectives in its CLA course training material. To apply for your Novell CLA, please fill out the required form at Novell. You will need to provide your LPI ID, verification code, name and contact information. All LPI alumni are able to validate their LPIC status by providing their LPI ID and verification code. Please refer back to this page for further information on the availability of Novell training programs which are based on LPIC-1 objectives for self study, on demand, and partner-led classroom training. LPI alumni will know that LPI has worked with Novell for a number of years on exam development and that Novell provided an initial industry endorsement of our LPIC-3 program. This new partnership with Novell further demonstrates that LPIC-1 is the industry standard in Linux certification and confirms LPI's longstanding position that LPI certification qualifies IT professionals to work on any Linux distribution.